– What are random flares? Good day Clint here with some more information to help you reverse your rheumatoid arthritis symptoms. And today I’d like to answer for you a question that comes from Rosemay. She asks I would love help with stopping the seemingly random flares that I get in my knee and wrist. I realize this is complicated without providing further information, and I think stress and environmental weather changes play a big part. Well, a couple of things first. Let’s talk about random, randomness, and let’s talk about the word flares. And let’s go with flares first. So first off I don’t use the word flares, it’s not in my vocabulary in terms of how I describe conditions, how to get well. We never talk about eliminating flares, anything like that in any other work that I do with anybody. The word flare is a medical term, and it puts inside of us a feeling that we’re out of control. That this disease is spontaneous, and it’s triggered by things that we have no power over. In some cases, you know we’re talking about the weather which can for some people play a role, I feel like that’s out of our control. However so much is under our control with this condition, and those things that we do will then influence our gut microbiome, which then influences how our symptoms feel. So if we back right up, and we do a day of water fasting or two days of water fasting. For 19 out of 20 people, most of the pain goes away or dramatically diminishes. So when we start adding things back water, food, you know stress as Rosemay mentioned. These influence our gut microbiome, which then influences the immune system. So if we apply a consistent pattern of behavior with our foods, our exercise as well, our stress levels, and also supplementation, then we’re going to get the same outcome with our symptoms. 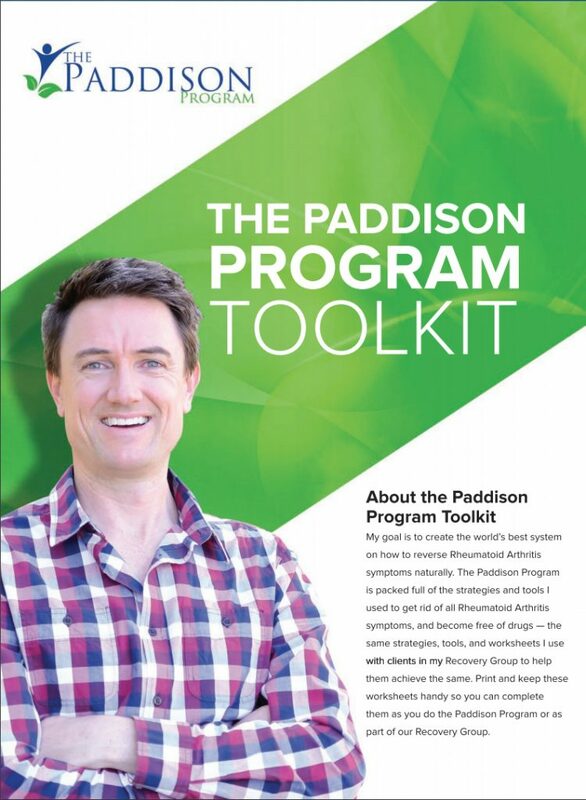 So this is what I call the 4 days of Groundhog Day that we do on the Paddison Program right at the start. We want to be able to demonstrate that repeated behavior creates repeated symptoms. And when you have that experience, this whole feeling of concern that the disease is unpredictable and frightening, and scary, because it can suddenly attack you at any time with some giant flare is a load of hogwash. The disease responds to the influences that are largely, and mostly under our control. Now that doesn’t mean that we can do something tweak really quickly and get rid of the condition, nothing happens quickly with this disease. You can either heal very very very very very very slow or very very very slow. Okay, nothing happens fast but we can credit control of what the level of symptoms is over a period of time. So we wake up we feel the same as yesterday or maybe a little bit better but very very similar. So this ties in, this 4 day Groundhog Day with our ultimate goal, which is to have a situation where we have complete confidence and control over the condition. So being able to create 4 consecutive days, we say you know what if I’m able to achieve that, it’s a sample of what my future will look like. But with a more diverse diet, with a more established exercise regime, and with less pain, and quite possibly lower dependency on medication. And so we get a sample, and we can (inaudible) like that into the future of what we’re trying to achieve. So that’s flares, we want to think it instead of flaring out of control, we think of I’m in control and I in my own rheumatoid arthritis puppeteer, and I’m learning how to control the strength better every day throughout my journey. Now, next part of this is she said these random flares that she gets in the knee and wrist. So let’s talk about the knee and the wrist. Very different challenges associated with both, way beyond the scope of this short video and the way that I’ll respond to Rosemay. But all the small joints they like to have lots of cardiovascular activity, and very little personalized attention. So we’re talking about the metatarsals in the feet, talking about some people getting the heel, talk about the ankles wrists, fingers, and even the jaw. These particular areas don’t require you to push, and stretch, and strain, in fact the opposite is true. We just need to give them some space, and don’t compress them if they’ve got inflammation and synovitis. We want to allow them to have one mechanism of improvement and that is increased blood flow, increase heart rate, cardiovascular exercise, and sweating. This time and time again will clear out these small joints. In fact if you go on a treadmill, and you look at your fingers if they’re inflamed before you get on. Sorry I should say a stationary bike you go on a stationary bike, and you look at your fingers beforehand, and then I want you to build up to sweating by 20 minutes. By the 30 minute mark when you’re still perspiring and you stop the bike at 30 minutes. Take another look at your fingers, the skin around the knuckles will be more loose and you’ll be able to pinch and get a little bit of a pinch on top of that skin that was previously tight. There’ll be less redness, and they’ll feel cooler on your lips if you put your fingers to your lips. These are all signs that inflammation in that 30 minutes has been removed from those joints. So the small joints require that approach. Now there are some each and every one of them has some additional little tweaks that we can do but they’re not game changers. We’re not like that’s your 80 20 principle right there. Get moving, get cardiovascular exercise and that help all the little joints. Now, the knee is a completely different beast. The knee requires strengthening, and stretching, of all of those muscles in and around the knee and it’s beyond the scope of this video. The video that I have for this if you’re interested and you have our advance ceiling package it’s 52 minutes long going through all the things that had to be done, that I had to do to heal knee. So that’s what I recommend if you’re on the program just log in and watch that video. iI you haven’t got access to a gymnasium and you are a member of the program, I’d suggest definitely go to Bikram Yoga as an alternative. And Bikram Yoga will definitely help to strengthen knee joints but look really this is a whole massive topic. So anyway you got strengthening around the knee, and stretch those tight ligaments. A physiotherapist could help you, if you want to work with a physiotherapist. As I said Bikram Yoga, starting out very low on a stationary bike at the gym is very very helpful at first but make sure you stretch afterward. And yeah but it’s a big topic so I hope that’s helpful today. We talked about random flares, we’ve talked about clearing out little joints, and we talked about what a big challenge it is to overcome RA in the knee. It requires a great amount of strategic approach, and I hope that I can help you with that. If you want my help with that with those materials I mentioned. And if you like this video, and you’re watching this on YouTube please give thumbs up big boom, and also subscribe so that you can get these videos straight to your inbox when I create new ones. I love you guys, work hard on your health. Nothing is more important because when you got good health, you feel good, you’re happy, you’re (inaudible) people in your life, and it’s just so much better so it’s worth it. As Bikram Yoga says 90 minutes of suffering a day in a Bikram class, is better than 90 years of suffering. And you can apply that across any kind of aspect of activity that you’re doing. If it’s green juicing, you’re better off spending 10 minutes making your green juice than suffer in the next 10 years. So let’s apply that and let’s keep the hard work going. There’s nothing easy about this. It’s a swab and it’s slow but there’s nothing more important. So keep at it. Love you guys bye for now.